CHICAGO--(BUSINESS WIRE)--Jul. 2, 2018-- Debra A. Cafaro, Chairman and Chief Executive Officer of Ventas, Inc. (NYSE: VTR), has been elected Chair of The Real Estate Roundtable (“RER”) for their fiscal year beginning July 1, 2018. 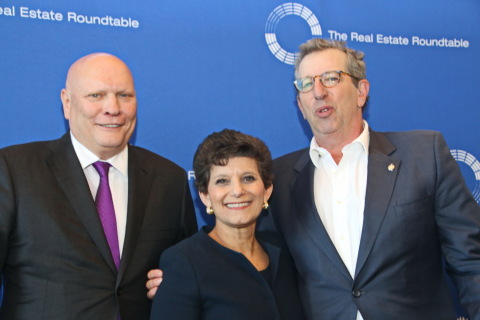 The Real Estate Roundtable, led by President and CEO Jeffrey D. DeBoer, brings together leaders of the nation’s top real estate ownership, development, lending and management firms to address key national policy issues relating to real estate and the overall economy. Ventas, Inc., an S&P 500 company, is a leading real estate investment trust. Its diverse portfolio of more than 1,200 assets in the United States, Canada and the United Kingdom consists of seniors housing communities, medical office buildings, life science and innovation centers, inpatient rehabilitation and long-term acute care facilities, health systems and skilled nursing facilities. Through its Lillibridge subsidiary, Ventas provides management, leasing, marketing, facility development and advisory services to highly rated hospitals and health systems throughout the United States. References to “Ventas” or the “Company” mean Ventas, Inc. and its consolidated subsidiaries unless otherwise expressly noted. More information about Ventas and Lillibridge can be found at www.ventasreit.com and www.lillibridge.com. The Real Estate Roundtable is a public policy organization that represents the interests of the real estate industry in Washington DC. Further information can be found on the organizations website at www.rer.org.